The W.C.T.U. met April 19, 1932 at the home of Mrs. John C. Lincoln. The meeting was opened with a song. The scripture lesson, led by Mrs. Loisa German, Was taken from the forty-first chapter of Isaiah. The minutes of the last three meetings were read and approved. It was moved, seconded and carried that a bill for flowers should be allowed. It was also moved, seconded, and carried that a bill of thirty cents for text cards be allowed. 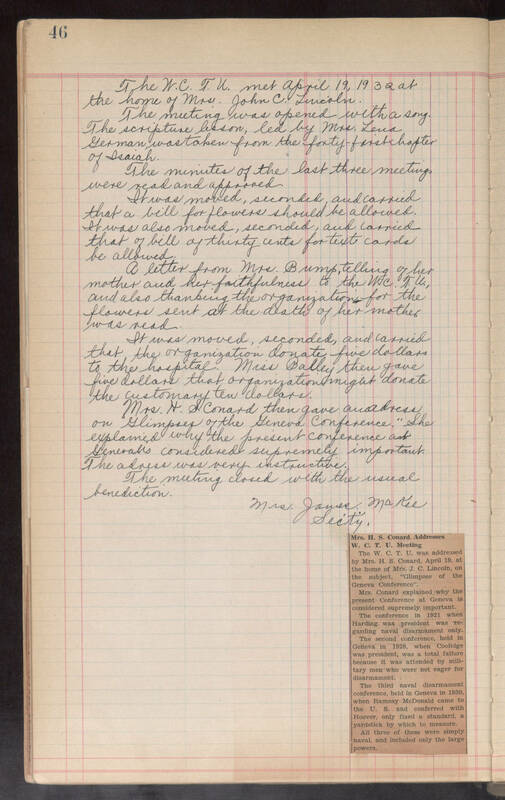 A letter from Mrs. Brump telling of her mother and her faithfulness to the W.C.T.U., and also thanking the organization for the flowers sent at the death of her mother was read. It was moved, seconded, and carried that the organization donate five dollars to the hospital. Miss Balley then gave five dollars that organization might donate the customary ten dollars. Mrs. H.S. Conard then gave an adress on "Glimpses of the Geneva Conference." She explained why the present conference at Geneva is considered supremely important. The adress was very instructive. The meeting closed with the usual benediction. Mrs. James McKee Sec'ty. Mrs. H.S. Conard Addresses W.C.T.U. Meeting The W.C.T.U. was addressed by Mrs. h.s. Conard, April 19 at the home of Mrs. J.C. Lincoln, on the subject, "Glimpses of the Geneva Conference". Mrs. Conard explained why the present Conference at Geneva is considered supremely important. The conference in 1921 when Harding was president was regarding naval disarmament only. The second conference, held in Geneva in 1928, when Coolidge was president, was a total failure because it was attended by military men who were not eager for disarmament. The third naval disarmament conference, held in Geneva in 1930, when Ramsay McDonald came to the U.S. and conferred with Hoover, only fixed a standard, a yardstick by which to measure. All three of these were simply naval, and included only the large powers.